(CNN) -- On this month's The Screening Room, host Myleene Klass heads to the Croisette for the 62nd Cannes Film Festival. While the recession has taken some of the luster off of the famously extravagant festival, movies from a virtual "who's who" of A-list directors show the world that no other film festival compares with eleven days on the French Riviera. 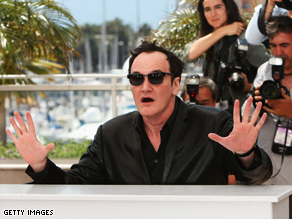 Quentin Tarantino's "Inglourious Basterds" is one of the most highly anticipated films at Cannes this year. The competition for the Palme d'Or is likely to be as fierce as ever, and one of the biggest stories at Cannes is the debut of Quentin Tarantino's "Inglourious Basterds," a World War II action movie starring Brad Pitt -- the only movie by an American director to compete for the festival's highest honor. Pedro Almovodar's "Los Abrazos Rotos," starring Oscar-winner Penelope Cruz, as well as previous Palme d'Or winner Lars von Trier's "Antichrist" lead a particularly strong European contingent of films into the festival -- not to mention films by Jane Campion and Ken Loach, also former winners of Cannes' highest honor. Also playing out of competition at Cannes is the late Heath Ledger's last film, Terry Gilliam's "The Imaginarium of Dr. Parnassus." Johnny Depp, Jude Law and Colin Farrell have all stepped in to play various facets of Ledger's character. As if there wasn't already enough star power on the Riviera, Ang Lee, Catherine Deneuve and football legend Eric Cantona will also walk up the steps of the Palais. Former president Bill Clinton also hosts amfAR's 16th annual Cinema Against AIDS gala. The star-studded event, featuring appearances from Sharon Stone, Harvey Weinstein and a live performance from Annie Lennox, hopes to raise millions of dollars for charity.